The cost of monthly soft contact lenses has been steadily rising in recent years, making it more and more difficult for customers to afford them. We have listened to our customers and searched the world for a low cost, trouble free monthly contact lens to provide our customers with the convenience of monthly lenses at the lowest possible price. We have found a lens that has it all - Crystal Monthly. 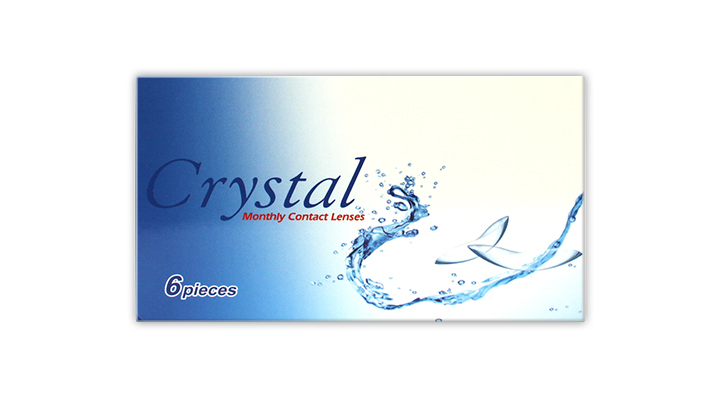 With Crystal Monthly we bring you a lens that offers a multi back curve design for great stability and handling, a thin edge for all day comfort, an easy to open packet, UVA & UVB protection, CE and ISO approved for maximum safety and an easy direct replacement for existing monthly lenses on the market. If you are currently wearing a monthly lens i.e Focus Monthly Visitint, Acuvue two weekly, Surevue, Biomedics 55, Frequency 55, Soflens 59 , then Crystal monthly lenses would make a great low cost alternative. Bloggers - do you have a popular blog that reviews products? Contact us and you could get FREE Crystal Monthly Contact Lenses for a review on your blog site. I have been wearing these for just over a week and find them very good. I have not been wearing lenses for long so don't know what the more expensive ones are like, but these seem to do the job very well. I will be buying these again! I have now been using these lenses for 6 weeks and cannot believe how good they are. Fot the first four weeks, I wore one crystal lens and one Air Optrix Aqua to compare ease/difficulty in insertion and removal to/from eye plus comfort in wearing up to 16 hours per day. The crystal won hands down. For the last 2 weeks I have worn both crystal lenses and can report that they are superb. The only reservation I have is their Oxygen permeability, I cannot find any data on that. Unless I find out something bad or there is a sudden price increase, I shall be buying these lenses in future. Editor`s Comment: Crystal Monthly are the same material as Biomedics 55 and a similar oxygen permeability to Acuvue 2 and Surevue. They are an older generation material and as a result, do not have the increased oxygen permeability of the newer lenses that often contain silicone. I’ve been ordering and reviewing the Crystal brand contacts. I started with Crystal Aquas and now I’m using the Crystal Monthly lenses. These contacts are awesome!! I haven’t worn monthly lenses in years, as I was always a daily lens person. These lenses are amazing and I can wear them over 10 hours a day. I’m very pleased and the cost is awesome too. I like how this company does immediate conversion to the USD, so I don’t have to convert myself. I’m definitely a fan of the Crystal brands. I got these around 2 years ago and I haven't been anywhere else.. I wasn't expecting much as price of them and thought wouldn't last.. these are just brilliant and last the whole month.. I have tried others and they are either to thick or they break quick.